Aachen, 29.01.2019. 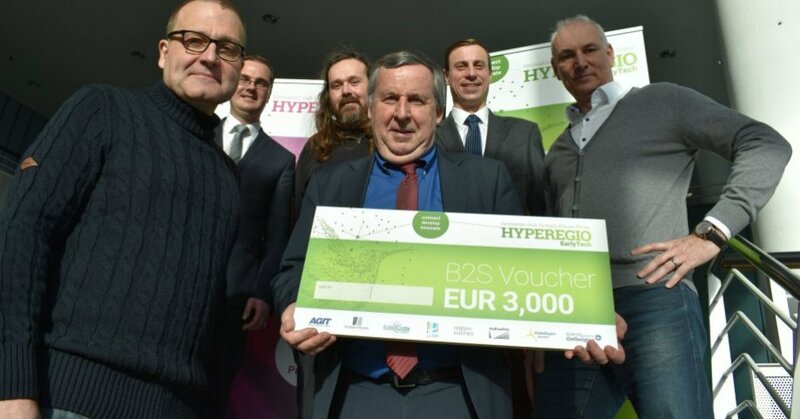 Today the business development agency AGIT presented two 3,000 Euro vouchers to the Aachen companies DynChem GbR and TFI GmbH as part of the euregional project “HYPEREGIO – EarlyTech”. Together with BraidSec BV from Geleen in Limburg, the Netherlands, both want to lay the foundations for the development of new products made of carbon fibre composite materials. “We want to develop a high-pressure container to hold the rock samples made of carbon fibre reinforced plastic,” said Dr. Dirk Prinz, one of the founders of DynChem. “With the innovative design, which allows the use of imaging techniques, we can achieve a new quality of analysis possibilities. This will set us apart from other manufacturers worldwide,” added Pieter Bertier, the company’s founder. As a young start-up, DynChem manufactures laboratory equipment for investigating the flow behavior of liquids in porous materials such as rock. Dr. Bayram Aslan, Managing Director of TFI Aachen, explained: “With the voucher we can take the first steps to optimize the structure of the composite element. The use of damping can fundamentally reduce the amount of maintenance required for tufting machines and offers potential for mechanical engineering in general”. TFI is engaged in research, testing and certification of building products for indoor use. A core competence in the field of research is tufting technology, a comparatively highly efficient process for the manufacture of textile floor coverings. Together with BraidSec, a novel damping system made of carbon fibre reinforced elements for tufting machines is to be promoted. “The two projects demonstrate the great innovation potential in the Euregio Meuse-Rhine, which we intend to exploit to a greater extent by bringing together cross-border partners in the three-country corner. We hope this will create the basis for new, innovative products,” said Dr. Lothar Mahnke, Managing Director of AGIT, which is in charge of the project.